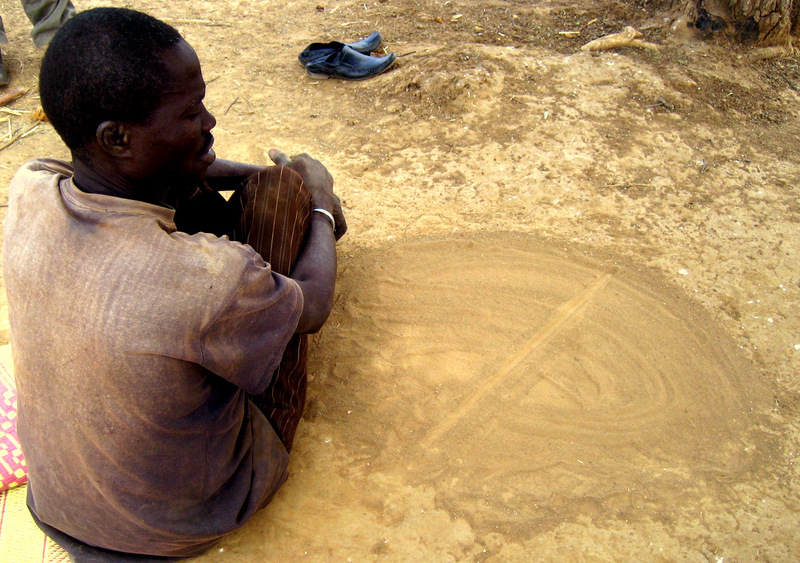 Like palm or tarot card reading in other parts of the world, here in the eastern region of Burkina Faso we have sand reading. As my buddy Joey describes it, the idea is that since the sand is from the Earth a sand reader can use it to talk to the Earth. Many important leaders and even government ministers look to the sand for advice on tough decisions so they can get advice or know what will come to be. Three of us met up with a sand reader who took us en bruse about kilometer away from his house. We sat on mats around the sand reader and his pile of sand which he had prepared by placing loose sand on top of hardpacked mud with a daba, a local tool that functions as a hoe. While he spoke pretty decent French, we also had our Gourmanchéma instructor with us, so we did the whole session in Gourmanchéma translated to French. Our first instruction was to touch the sand and make a slow circular motion with our finger. While we were doing this, we were supposed to think of a question “in our hearts.” The sand reader then ran through a series of drawing symbols in the sand. 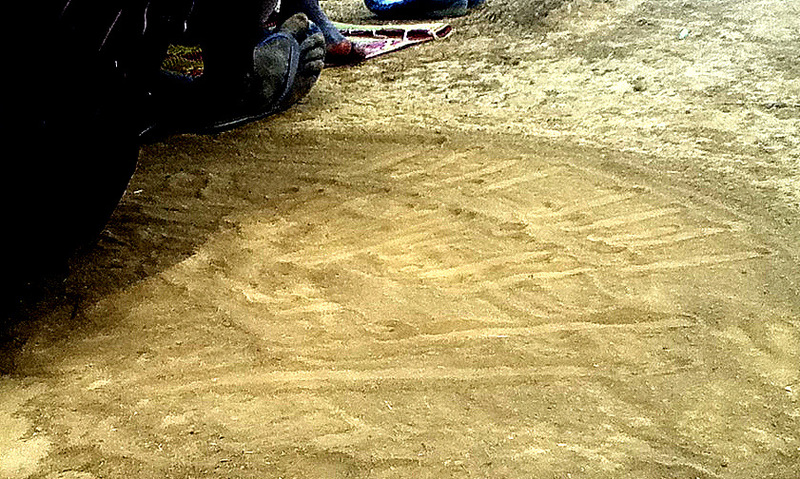 Though I missed some of the detail, it appeared as though he drew four arches, not unlike a rainbow. He then used two fingers and made small u-shaped lines underneath each arch before crossing out each of the four arches one by one. He then “banked” a score for that series. This was repeated four times. Next, he asked what your question was and used your four banked scores to interpret what the sand says about your future. Each score was represented by lines/dots made with two fingers. When and where will I meet my future wife? What type of work will I do when I finish with Peace Corps? My future boss, a woman, will call me and ask to help out on something for what is supposed to be a short-term project. Either the industry or specific company will be female dominated. It will turn into a full time job, which I will initially dislike, but eventually grow to love. Thanks and congrats on the post! My advice, for what it’s worth, is to take off as much time as you can from work and see lots of friends/family and eat as well as you possibly can! Shoot me an email if you have any q’s. As much as I hate to ask this question, here it goes… Do you really believe all this? Are you honestly going to dismiss any feelings you have for any woman you might find and like just because you found her first and not the other way round? I personally do not believe in mediums, soothsayers,fortune tellers,psychic readers, probably because I am a Christian, however I do believe that some people are endowed with special gifts to predict the future or heal etc but I would rather know what source their power is coming from before I even seek any piece of advice from them. I have wondered so many times why fortunetellers, soothsayers can predict other people’s future but how come they cannot predict theirs or use their powers to know when death will come knocking at their door so they could escape it or use their power to win the lottery. You should have asked him if he could predict the future of Burkina? Did he see the crisis ahead? Why didn’t he report it to the authorities so that none the chaos would have erupted? I think the beauty of life is it’s uncertainty, it’s mysteries. Life isn’t worth it if you are unwilling to take chances and work for your future. Life is worth living not knowing your future,so you don’t struggle to make choices when you’ll be unsure of the relevance to the predicted outcome. Knowing what’s in store can change the way you live your life. Not knowing what the future holds inspires us to work towards fulfilling our destiny and it allows us to discover our place and purpose in life without subjectivity, false hopes, hopeless dreams and complications. I believe that life is meant to be simple but we make it so complicated. Not knowing tomorrow is what keeps you motivated to see what tomorrow has in store for you. What is the fun and excitement if you know your future? All you do is wait around and hope it happens. Let your future unravel itself in a special way. I doubt that you would travel to Africa if you knew how each experience would be like or what eachday had in store. The excitement is finding new knowledge, experiencing the unknown and embracing what life has in store for you… Knowing the future will just take all the fun out of it! what you need to know is that if the person who is telling your future goes into detail about your past and present and they are right about it then what they say about your near future will be very close to what will happen but you also have to remember that every choice you make every day can change the outcome of what your Future will be, if they are really vague and say normal stuff like what just about everyone has problems with then they probably are a scam. That said, great truth can be found in fiction as well as reality. If you got something worthwhile out of the visit, that helps you along your future path, why be concerned about the ‘truth’ of them? If it has helped you, I wouldn’t be concerned. That said, if I could see anything, I would like to know the future of my child. That way, I can protect her/him from the cruelty and danger of this world! That said, take everything in life with a grain of salt, weigh it against what you know and make your own decisions. Don’t get bogged down in ‘so-and-so said! How do you know if they are telling the truth and what is the ‘truth’? Not to worry Kareen – this was just a fun cultural experience! I put just as much faith into this as I do with any other form of psychic reading (read: none). I appreciate you looking out for me though!